The Essential Guide to Healing was on a list of books available for review and, well, as you can see, I couldn't resist. I'm quite uncertain as to whether I made a good choice or a bad one. I should probably start by saying that I've had some "run-ins" with Bill Johnson and his Bethel Supernatural School of Ministry and Healing (based in Redding, CA.) The church we were formerly a part of started exploring what Bethel had to offer, and a few friends attended their school. I've browsed the school's website, I've read books recommended, and I've watched videos/listened to "sermons" and am generally familiar with their mission. Before going too much further, here are three things about me to keep in mind as you read the rest of this review. #1 - Although, like Bill Johnson, I'm not a cessationist, I don't make that issue into more than it needs to be. I believe that God can and does still work miracles and healings when and where He pleases and for His glory. I don't believe our theology should limit what God can and wants to do. (e.g., "No, God. You're done with your miracles. No more wonder-working for you!") I believe I should be very grateful to the Lord when we see true miracles occur, and give glory to the One to whom it's due. (After all, that's the point!) And when the miracle that we're wishing and praying for doesn't happen? I believe we should say with all of our hearts, "Thank you, Lord, for remaining faithful and working even through this situation. Teach my heart to trust and believe in You, regardless of what I may see and think in this [emotional] moment. May You receive the glory in all of this." 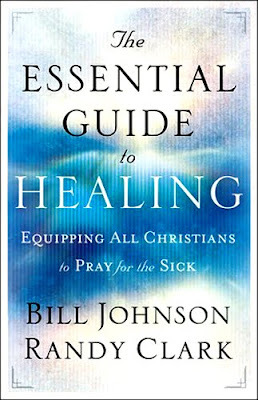 This book is co-written by Bill Johnson and Randy Clark. They begin the book by providing an introduction, if you will, as to how they came to believe in a ministry of healing. They each have their own personal life story that caused them to come to a place in their spiritual walk where they believe that miracles not only can be expected, but should be expected. Frequently. All it takes is a walk with the Holy Spirit, which is hard to describe exactly, but they explain through many anecdotes of healings. They state that if you dive deep into a relationship with the Holy Spirit, you will learn to know what God wants in various situations and, in fact, you will be a vessel of His power in bringing it to pass. And what does God want? Well, Johnson and Clark believe that God wants to heal the sick, raise the dead, mend wounds (seen and unseen) and remove evil spirits from lives. This all sounds attractive, no? The problem is that they do not acknowledge the Book of Job, Paul's thorn in the flesh and any other number of trials and tragedies that were faced by God's people in the Bible. (Again, see 1 Peter 4:12-19.) They do not acknowledge that God may intend for unpleasant things to happen to His people. The idea that God would set a challenge (health, financial, spiritual, emotional, etc.) in front of a person to refine them as pure gold, to purify their hearts, to make them more like Him, is ignored. Instead, Johnson and Clark believe that God only wants "good things" (i.e., health, peace, etc.) for His own. One of the greatest disservices that you can do for another Christian in the midst of a personal trial is to tell them that God made a mistake, has no purpose in their pain, or that anything bad that happens is a result of the devil being out to get them. I wholeheartedly shun these remarks. (And I feel like I can do so freely and openly, as we had such statements made to us numerous times upon the death of various family members, several of which happened within a very short period of time.) The idea that God was NOT in my pain was loathsome to me. I fume at the remark that God surely didn't mean for certain things to happen. If I am not being held in the palm of God's hand, then I have reason to fear everything. (Isaiah 49:15-16) I should never get out of bed in the morning; something bad might happen. Never should we drive in separate cars to any event; one of us might die on the way - alone. I should never take a financial risk. I should never enter into any relationship of any sort because it could be sabotaged by the devil. One of the things I greatly dislike about Bill Johnson and his ministry is the over-use of words like, "honor" and "love" and "respect". The word "honor" does sound good, doesn't it? It's awfully hard to argue against. The problem is when the honor of people trumps the honor of God, and suddenly honor is simply reduced to blind conflict-avoidance. 2 Tim. 4:2 instructs us to, "Preach the Word; be prepared in season and out of season; correct, rebuke and encourage--with great patience and careful instruction." Recognizing that God's truth should be applied in all seasons, we should not hesitate to ask hard questions and challenge our fellow believers from scripture. When we instead choose simply to pray until a miracle happens, people do die from cancer - unprepared, because they were waiting for healing. Relationships crumble - by surprise, because they expected the Holy Spirit to keep everyone feeling good until the problems disappeared. Applying Johnson's teaching results in Christians who, rather than being open, honest and humble enough to receive the instructive Word of God, become greedy for perceived goodness and fixate on it, avoiding having to confront sins and shortcomings in their lives. I take issue with Johnson's theology because it tends to make people think that if someone is suffering a long-term illness, it's because there is a defect somewhere in a connection to the Holy Spirit. But, as Christians, we should all know that the Holy Spirit doesn't exist to give us warm fuzzies and King Midas' Touch; it was sent to remind us of God's Word, proclaiming the gospel to us and through us. An effective, spirit-filled life is not one that's free of pain and suffering – in fact, scripture tells us to expect quite the opposite. I'm left with questions. What is the ministry of the inner court verses the outer court? How do you minister to God? Does He need us to minister to Him? How? Why? The book has many anecdotes like these, and I suspect that a reader who is completely unfamiliar with the authors and their ministry would be somewhat baffled trying to figure out what exactly is being said. The authors frequently invoke phrases that sound nice on the surface, but are too ambiguous to really mean anything concrete. Finally, I believe that building your faith around the presence of frequent miracles promotes disappointment (when relationships and bodies aren't healed) and depression (when people do die of various illness and accidents) and general discouragement. People are whipped up into a fine-feathered frenzy when going out to do miraculous things, but I've seen far too many examples of peoples' faith crushed when things don't turn out like they wanted. If they would only believe that God is the sovereign ruler over ALL and does all things well, they might find themselves contented and comforted with the peace which passes all understanding. The truest miracle is that of salvation by grace and through faith alone. Believe on the Lord Jesus Christ and you will be saved. This is truly a miracle we cannot fathom. And if we believe that simple and yet complex truth then our sins will be washed away, and when we do eventually die, we will be able to stand before the Lord of Heaven and Earth and be received unto Him -- for His glory. The path to Him is not easy, and He never said it would be. He said it would be hard and frustrating and that we would hurt. He said that we can not expect to live a greater life than Jesus. (Matthew 10:21-25) Jesus hurt. He wept. He felt and endured great pain, and therefore it should come as no great surprise when we do also. Can we pray for healing? Absolutely, yes! Jesus invites us to pray and goes so far as to teach us how to do so. (See Matthew 6:5-15 for starters.) But let it be His determination whether or not it's in our best interest to receive healing or whether our hearts need some discipleship through pain. We need to remember that God's answer is not always, "Yes!" to our requests. Sometimes it's "wait." Sometimes it's "no." Trust in the One who made everything that You see. Believe that He is good. Believe that He has made a promise to you, as a faithful believer, to work all things together for your good. Be grateful for all the gifts You receive from the giver of all good things and rest in peace knowing that He who began a good work will be faithful to complete it. So fear not. He is the Lord - not our faulty selves! His grace is sufficient for all things and His power is made perfect in weakness. Praise be to His name. I received this book from Chosen Books, a division of Baker Publishing Group. All opinions expressed above are entirely my own. I suspect you know this but...there 'tis! Just by the title I was surprised...then I read your opening paragraph and it all made sense! I've never heard of this book or these authors, but I am familiar with this theology, and cannot fathom what these people do with vast portions of Scripture that doesn't match up with their beliefs. I agree with just about everything you've said here. "Applying Johnson's teaching results in Christians who, rather than being open, honest and humble enough to receive the instructive Word of God, become greedy for perceived goodness and fixate on it, avoiding having to confront sins and shortcomings in their lives." I found this to be a very powerful statement, Carrie. Having gone through a church that believes as this book does, it brought great confusion, disappointment and guilt when the things I wanted weren't occuring. Yes, we are to believe for healing, but we are also to know that God knows all and has a plan and we are to trust Him knowing He is God. This is health and wealth. I don't think you should apologize for calling it what it is. This is sooo frustrating for me. It's pretty clear EVERYWHERE in scripture that the Christian life is hard. Not only that I'm pretty convinced God gives us pain to remind us that this world is not our home. And what happens to believers who don't get everything they want from their cosmic Santa-God? YIKES! I have to admit I laughed a lot when reading this. "Spirit-filled editor" hahahaha! God is not our cosmic bellhop. We cannot even fathom understanding His plan. We can trust that everything will work together for the good of those who love Him! So many conversations popped into my head during this post! I was surprised to see this title in my Google Reader. Especially knowing about the losses your family endured. But once I started reading it all made since. Health and wealth doctrine makes me crazy! It makes my disease and lack of healing my fault because of my lack of faith or relationship with the Holy Spirit. And what about when bad things happen as a result of someone else? The authority thing is a whole other issue. Huge red flags start waving when someone in decision-making roles starts saying I should trust his judgment and go along with what he thinks is right because God put him in authority over me. Where is THAT in the Bible? Or what about "children honor your parents?" Honoring an adult parent is NOT enabling him/her to continue destructive habits or making those habits seem acceptable to our children. Carrie, a well thought out and well written critique. I wholeheartedly agree. I would add that the natural corollary of this thinking is that when healing (or wealth!) does not occur, there is something wrong with the person, not with the theology. "You would have been healed IF..." And then, the hurt is compounded. Not only am I in pain, but now I have guilt because it is all my fault. I also would like to draw a parallel between the "health and wealth" philosophy so popular among the more charismatic (for lack of a better term) on the Christian spectrum and the spiritual "health and wealth" doctrine as promoted by the ultra-conservative groups (Gothard) and others. Similarly, a lack of healing of relationships, etc. is the fault of the person, not the bad theology. Thank you for a great lesson on "fear", too! It's yet another thing I struggle with. Well spoken. While I'm not familiar with this specific organization, I have some familiarity with the health, wealth, and prosperity story line. A huge thing I've come to realize as I've been studying Systematic Theology is how flawed our concept of "good" is. So often, we describe it as the health, wealth, and prosperity storyline does: as physical and mental ease. But "good" is really defined, not by us but by God. Good is what God decides is good, not what we decide is good. The health, wealth, and prosperity storyline presumes that God deems whatever we deem good to be, in fact, good. Which is, of course, totally not true. Praise God that His ways are higher than ours and His thoughts higher than our thoughts. Outstanding review--thank you for suffering through this book to speak Truth. I hope someone who has been sucked in by this theology has seen your post!